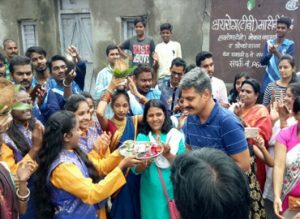 Within 15 days of Feedback Foundation initiating a pilot decentralized solid waste management project in Aurangabad, 2 clusters Gautamnagar-Pragatinagar of a municipal ward have achieved ‘No Open Waste’ status. This achievement is mainly attributable to the triggering of resident women of the ward by the Foundation, and their collective action. The ‘SambodhiBuddhDhamma Vikas Mahila Mandal’ is providing immense support to the Foundation for mobilization of citizens at the household level for segregation of waste at source and composting of bio-degradable waste. Women keep watch in the mornings to ensure no open littering by residents going for their morning walk. Residents are delighted that the roads which were full of garbage earlier, are now free of open waste and not even a candy wrapper is visible.